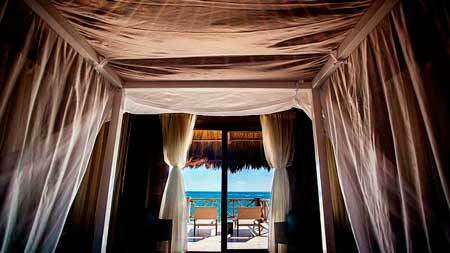 The Master Suites at Sian Ka’an Village are panelled and decked with dark tropical hardwood, each with a large oceanfront terrace that gives you the impression of being a captain upon a Spanish Galleon looking to the horizon for sightings of buccaneers. The ground floor Master Suite features wood-beamed ceilings while the upper level Master Suite enjoys a lofty palapa roofs with open beams. Inside each Master Suite, you will find a comfortable double bed dressed with fine quality linens, a goose feather duvet and pillows (synthetic options available for guest with allergies). There is also plenty of space to add an additional foldaway bed for guests with children. The en-suite bathroom is camouflaged by wooden panels offering modern twin vanities, large closet spaces, bathrobes, slippers and luxury towels. The shower cubicle, with rain shower head and WC are set behind the sinks.